Nuke and the Pixel Cloud plugin for After Effects offer a great feature that lets you relight a 3D image by converting the points of that image into a pointcloud. For this a PointPosition render pass is required. Basically this is a pass that encodes the XYZ position of each point of the rendered image into its colour information. Therefore you need to use 16 or 32bit images for the output. While this is possible with Maya, Cinema 4D unfortunately does not offer a pass like this out of the box. It is possible to get a similar result by using a shader that has three ramps, one for each colour channel, but this means you would have to swap out all materials just for this pass – hardly convenient. This plugin makes it convenient! To install un-zip into your C4D (R12 or higher) plugins folder. Note: you have to turn off ALL anti aliasing for this to work, otherwise you get faulty results on the edges. 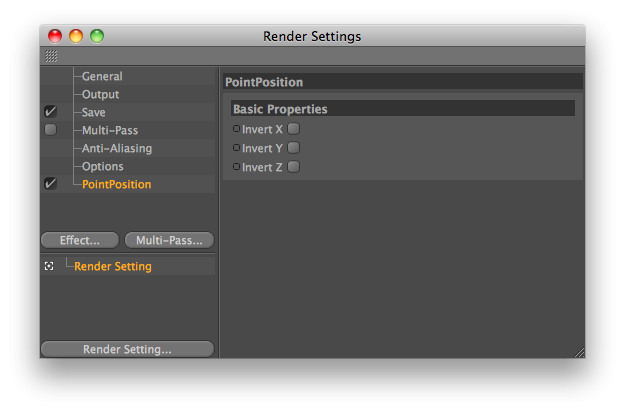 Also, for Nuke you probably want to check the “Invert X” box in the filter’s option. I have not yet worked out whether it is at all possible to get to the pre-AntiAliasing render results, it appears one can not. I would prefer it to be a multipass plugin, but again, so far I’m still trying to figure out whether that is even supported (the SDK doc is rather quiet about this). Let me know if this is useful for you!